Is Game Designing for a Hobby Possible? Or Realistic? Game Designing as a Hobby? Many people who game design start out as hobbyists, then turn it into a full-time career. But what if you already have a career? This guide looks at the possibility of success at being a game designer in conjunction with an existing career. One of the biggest problems with game design is people underestimate how much time it will take. Hofstadter’s Law states that things will always take longer than you expect (even when you take into account the Law). If you already have a career, you can expect this time to triple (at least). I started professional game design when at university, and I put in some long hours to do professional-level work alongside my degree. Bear in mind how much time game design takes up, and the level it needs to be at for you to be happy with it, before embarking on professional-level game design as a hobby. Anyone who’s anyone in game design will tell you that it is, ultimately, worth it. But the paying public are fickle beings, and catering to the masses is always a tricky task. Expect thanklessness; people who don’t appreciate that you have a job and a life outside game design. And accept that, for some, your best will not be good enough. That’s the nature of a subjective thing like game design. I’m Still Interested – Where do I Start? If you’re thinking about game design as a hobby, you probably already have an idea you think is worth a little exploration. The easiest way to start is by exploring that idea. But, if you don’t have an idea, then just throwing some ideas out into the open and combining them can work. Once you have an idea, keep iterating on the design until you’re happy with the final product. Then, you can start building a playable game. Software licensing is a complex area, and if you’re ever in any doubt it’s wise to consult a lawyer. However, most software is free at point of access for hobbyists – including popular engines like Unity and Unreal Engine 4. When it comes to selling your game, many software licenses include clauses that give you a certain amount ‘free’ (for example, sell less than $10,000 worth and you don’t pay royalties on the engine). It’s always worth double-checking before you start selling, though. Help! I’m Not a Computer Scientist! While a degree in computer science isn’t necessary to start developing games, a little basic scripting (i.e. programming) knowledge is often useful. Websites like Coursera or Codecademy provide free programming tuition for beginners and up. However, there are technologies which allow you to develop games with little to no programming, but they often charge for the privilege. A little coding skill never hurt anyone, and it’ll make your life a lot smoother! 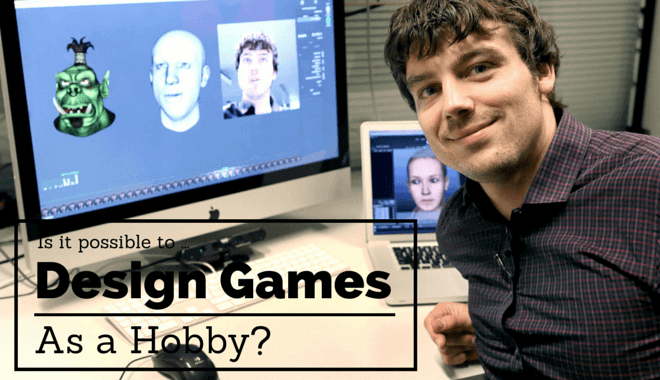 It is certainly possible to game design solely as a hobby, alongside an existing career or in supplement to it, but there are definite considerations to take into account. Game design takes time, and game design as a hobby will take even more time than usual. Sometimes the public are just thankless, and you’ll never please everyone. However, with a little skill and some free tools, more and more people are creating great games in their spare time. And the thrill you get from a good review is definitely worth it, in my opinion. Do Video Games Make You Violent? Video Game Designer vs Developer: What’s the Difference? Is the Gaming Career Right for You? Console vs PC Game Designing: What’s the Difference?